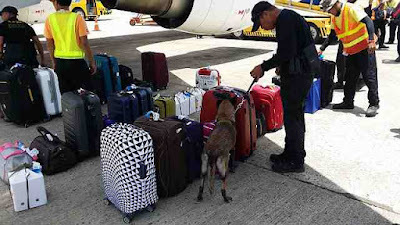 Aviation Updates Philippines - The Public Assistance Office of the Mactan-Cebu International Airport received a bomb threat yesterday reportedly on-board a Cebu Pacific flight from Davao City. 178 passengers and crew are on-board. "Charmaine Pacabes, the duty personnel of Public Assistance Office, said she received a telephone call from an unidentified woman shortly before 10 a.m. saying, “May parating na eroplano may bomba.” (There’s an incoming airplane with a bomb.)" The office later received another call from the woman saying that there is a bomb on a plane. She left the phone hang, and returned saying the bomb is with a woman on-board a flight from Davao City. She immediately reported it to the Aviation Security Unit 7 (AVSEU 7). The security team called Davao Airport but informed them that the plane has already left. Fortunately, the flight landed safely. The air traffic control commanded the pilots to stop the plane at the north portion of the runway for safety inspection. The passengers were quickly deboarded and was ferried to the terminal. The Special Weapons and Tactics (SWAT) team with the police and emergency services immediately inspected the aircraft and the cargo for possible confirmation on the bomb threat. The threat came out to be negative. Bargamento said they are now tracing the origin of the call for possible charges to be filed.